I am sort of on a writing about writing kick lately, huh? Well, today is no different. I have just been spending so much time on the subject because, well, let's face it, these kids have to know how to write for THE TEST! Now that it is on the computer, and pretty much everything requires a written response, it is imperative that I teach the kids the skills they need to adequately convey their thoughts in written form. Today, I thought I would share with you my secret to success when it comes to writing. Are you ready? Ok...here it goes. Yep, that is it. We write. All the time. Every day. Even for homework. The kids are constantly writing and formulating their thoughts coherently and with purpose. Did you fall out of your chair at that secret revelation? I thought not. It really isn't a secret at all. I read somewhere that it takes 10,000 hours of practice to master a skill. Writing is no different. If we don't give the kids the chance to write, and do it properly, they just won't get better. It is that simple. So how does my daily writing look? Well, it changes all the time. Some days the kids are writing paragraphs. Some days they are learning minilessons to make their writing more clear and concise. Other days, the kids are planning for an essay. It all changes each day depending upon the objects. What doesn't change though is that the kids are writing. The backbone of my writing throughout the year is my Paragraph of the Week. I begin with it on day one of school. I begin to teach my students how to properly construct a paragraph, with a topic sentence, the body, and the conclusion. The kids write informational, opinion, and personal narratives this way. Daily I teach the kids how to formulate a properly structured paragraph. After about two months of this (so 8 paragraphs total), my kids become experts at the basic structure. I then move them into essays. 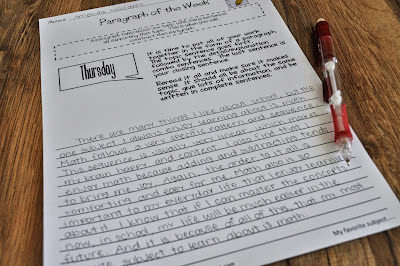 I use my Essay of the Month to get the kids very familiar with the process of writing essays. Basically, Essay of the Month takes what they were learning in Paragraph of the Week and expands it. They use the same structure, only make introduction paragraphs instead of topic sentences. Each of the detail/explanation pairs become paragraphs now. The concluding paragraph comes from what once was the concluding sentence. While they are writing essays in class, the kids are still practicing their paragraph writing at home. They continue with the Paragraph of the Week so that their paragraph skills stay fresh. Come January, I change the Paragraph of the Week, which is informational, opinion, and personal narrative, to the Fictional Narrative POW. The kids are really good at writing a nice, structured paragraph, but writing fictional narratives are slightly different. Not totally different, but different enough that the kids need further exposure. I send this home for homework, as well as work on it during class....all while the kids are STILL practicing essay writing in class. The rest of the year is interlaced with various writing projects but what doesn't go away are the POW and EOTM. Keeping the kids focused on this structure throughout the entire year enables them to become confident writers. They transfer the skills automatically to every writing piece that we do, whether it be answering a short answer on a reading test, writing a response to literature, or writing about science or social studies topics. The structure stays with them and helps them to create clear, concise, coherent paragraphs and essays on just about anything they are being asked to write about. It truly is the best thing I have ever done in my class to help create writers. How do you run your writing program in your room? great post. Teaching third graders to write is tough...this looks like a great "gradual release." My writing success has been finding text that r Hugh interest for my kiddos to write about! I'm definitely would love ur writing bundle! I love using the young writers program for NaNoWriMo during November to help them get past the hurdle of not getting enough words on the page. Once they learn that they can write hundreds of words, it's easier to go back and edit. You can't edit a blank page. I have been using your Paragraph of the Week. I love it. It really helps children write quality paragraphs. I also use 6+1 Traits. Focusing on each trait within each type of writing seems to help my kids produce better work. Daily writing in Math [middle school ] is a new district requirement. Algebra, I can come up with prompts off the top of my head. Writing, not so much. I think I could use the paragraph maker to answer EQs. Wow! This looks like a great, structured approach. My kids write every day too but I love the structure of your program. I have your POW and would love your other resources! Your prompts are very motivating!!! My secret to writing success is model, model, model! I find that students have an easier time when they know exactly what is expected of them. Also meeting with kids who are having the same struggles helps them to see that they are not alone and they can get ideas from each other! I too have your paragraph of the week and would love to share a copy with a teammate keeping the other resources for myself ;-). Modeling is critical and then do a controlled release of support. Finding time to conference with kids is always the stumbling block, especially with 27 third graders! Looks awesome! I'd love to use this to help my group improve their writing. I think writing everyday is important. I love how you have structured this! Very nice! My secret is the same as yours. Unfortunately your plan seems to be working better than mine. Writing keeps getting pushed to the back burner because of other things coming up in the schedule. Writing is definitely one of the scariest skills to teach in the upper grades! I love how you have broken every step down and scaffolded. I bought your paragraph of the week and it has been a LIFESAVER! Pair that with grammar and editing practice and my kids' scores have gone way up! I love the way you have organized your writing practice. I just moved up to upper elementary and I have been looking for ideas like these to help me make sure I cover everything! Very neat idea! I have been doing mentor sentences. It's time to move to paragraphs. Thanks for the great idea! Repetition is key. Love your Paragraph of the Week. This year I started using your Paragraph of the Week, and it has made a HUGE difference! Whoever wins this prize will win the JACKPOT! Writing is my nemesis! I'm trying to incorporate it into everything we do, but I really need a starting point! Your ideas are spot on! I'd love to have these for my classroom! Wow this is fabulous! My school uses Lucy Calkins, however I'm noticing that some of my kids still struggle with the basics... Making it hard to teach them in the way Lucy has planned. I would love to supplement with your program! I have been looking for ways to incorporate more writing for homework. These look like fantastic resources. I struggle with systematically teaching writing and also integrating it with reading response. Your paragraph of the week resource is great and I would love to utilize the other resources in this bundle, too. I have been considering purchasing some of these resources to supplement what I already do with my students. Writing is so difficult to teach and we're always pressed for time to fit EVERYTHING in! I love your ideas and resources - they're all on my wish list now! Love, love, LOVE POTW! Will be using Essay of the month soon! Writing is tough! I try to reach their hearts and minds through personal stories or mentor texts to help them get creative and pull out details! I think the students need the step by step instructions to writing. I try and have my students write on topics that interest them which helps motivate them to write. We write daily in Math as well but I would like a system that allows them to write daily and it be meaningful. I am still working on getting a strong writing routine in my classroom. Currently having my students write short responses every day, as well as individual writing conferences is my secret to writing success. I need to step up my writing instruction and getting more writing from my students! Thanks for sharing! Wow! I just proved the need to edit work before hitting the publish button! It should say "get" instead of getting! I try to find interesting and engaging close reading articles so that we can constantly weave reading and writing together! I have your POTW set, but would love to add the Essay set to my collection! I try to do many meaningful writing activities that are incorporated with reading. My favorite activity currently is using the News-o-Matic app/website with students for current event writing response. We have been able to do some meaningful persuasive and information writing based on these kid friendly articles. I don't know that I know the key to having successful writers, but I have been practicing and modeling like crazy. They need constant opportunities to write and to feel somewhat confident to want to write. Just added the POW to my tpt wishlist! Thanks for sharing! I have found using graphic organizers to be very helpful to make my students more successful with writing. Writing has never been my strength. I like the structure of your writing. Using graphic organizers has probably been my most useful strategy. I struggle with having a strong writing process. This looks GREAT!! What a great cohesive way to teach the writing process. I know it would really help my sixth graders! I love the idea of EOTM and the narrative of the month! Thank-you for putting this together! Amazing!!! I moved to second grade this year from fourth. It was a shock in the writing department when my students started with me this year. But from their initial writing sample to now they have made huge growth. We use thinking maps district wide, and pushing the idea of always "mapping" your writing out before you throw a bunch of words on the paper has significantly helped them. I do mini lessons on grammar, punctuation, structure, etc., but their ideas come together very well when they use their maps. I'd like to change their homework to include structured writing but haven't found anything I think will work for them just yet. Even after seven years in 5th grade, I still find teaching writing to be the most difficult subject. Every year I kick myself for not doing more writing. I think these resources would be perfect for not only scaffolding for the kids but for me as well!! I agree with you that writing, writing, and more writing is key--along with mini-lessons along the way to help them improve their writing! I struggle fitting in instruction for writing. I find I just assign small papers and expect my 6th graders to know how to write. This would be a great tool. This is fabulous. We started CCSS last year so my writing lessons shifted from years past. Now I find myself needing to redesign my plans. This will indeed help big time. I teach ESL in Argentina and I haven't had any success yet.... I'm confident something like this could help! Secret to writing success: Practice, practice, practice! I've always struggled with teaching writing but we've been writing daily this year too and the results have been great! I still wish we had more time since it seems that lessons drag on sometimes! Teaching writing and the writing process to my 6th grade students is my biggest weakness. We don't have a writing curriculum in my district. I have been trying to figure out on my own what to do. I am using SRSD strategies, but I need more scaffolding of the writing process itself to go along with it. Every year I feel like I am never doing enough to teach my students to be good writers. This is the one area that I dread teaching because I feel so inadequate. Your POW and EOTM have been on my wishlist for a while. I could really use them! Please also make a resource where students analyze texts and use text evidence in their informative and argumentative essays! That's what they will be tested over in February. I have followed your blog and your teacherspayteachers store for quite some time. Thank you for all your great ideas and products. Teaching writing is a challenge, for sure. Practice, practice, practice of course. Mini-lessons that model for students. My favorite is to leave time for the students to share their writing. They all love to share what they have written! Practice, practice, practice. It's my least favorite subject to teach so I feel like I have to work extra hard on iTunes. I use many of your products, and this one looks just as amazing as all of the ones in use in my classroom! Teaching writing is hard. I would love to win your writing set and how you teach the paragraph of the week. This is so great. Some of my students are still having trouble with the paragraph structure and I think this does a great job of breaking it into easily manageable chunks so it's not as intimidating. I can't wait to try it in my class. I love paragraph of the week! I want to start using essay of the month now too! I used your essay of the week pack when I taught 4th grade ELA and the majority of the student enjoyed it immensely. I teach math and science this year, and wish I could integrate this into our lessons! Like you said, I think the "secret" to good writing is practice. Along with that comes a class time dedicated to writing until I'm confident the students will practice good writing skills when they're working independently at home. Another secret is focus. Your resources look like they would really help with that aspect! Teaching writing is not my forte. I don't like to write, so I have to force myself to teach it. Your package you came up with looks like it would help me immensely!!! Looks interesting! Unfortunately I am required to adhere to my district's new curriculum (please don't get me started!) which includes writing. So, I'm trying to fit in my own writing on top of it. I know one thing that is NOT the secret: this curriculum! I started using paragraph of the week and I have noticed a huge difference in my students' writing. I love that they get that daily practice at home because of the POW. I've had some success this year with picture prompts and lots of quick writes. Then kids chose one to bring to final copy. Using graphic organizers helps with writing. Also, reading, reading, reading. As students become better readers, they become better writers. But it must come with lots of practice. In addition to using your 'paragraph of the week' program I also use 'writing for excellence' which helps students add more descriptive and detailed sentences. When teaching writing successfully, it always helps to break things down into smaller chunks and slowly build up what is expected of students. Your packs would be perfect for helping with this. I am struggling with this - trying to fit it all in! This would be amazing. Thanks so much for the chance! I love teaching writing and your program looks like a great support for my mini lessons! Writing, oh, the hardest skill to teach. Modeling is what I'm hoping that I can incorporate more into my lessons but I came across a new book called 59 Reasons to write by Kate Messner and in it there are a lot of really great ideas on having morning warm ups as well as incorporating story writing with your students. This really hits home because as a Grade 6 student, I remember my teacher doing this with us and I still treasure this more than one can imagine! I love your POW and we use it in my class daily! I can see the change in students' writing this year from past! Now only if I could get them to not capitalize letters in the middle of a word!!! I am still trying to figure out what works for me. I think your resources will get me back on track with my 6th graders. Writing is always the biggest challenge for me. I love these short, to the point practice ideas! I find it so hard to teach writing. My team teacher uses power writing, but I would love to add more into our curriculum! This resource seems amazing!! I would love to have this set. I have it in my cart on TPT and have wanted to purchase it all year. I have used your samples and it is great. Just having to save my money to purchase the bundle. Fingers crossed! I try to give students as much choice about what they are writing about as I can. I might choose the type of writing, but give them options for the audience and then leave the specific topic up to them. I think it helps keep them more motivated and helps them have more to draw from to write about. In all honesty my writing block for my 5th graders is not the greatest. I'm always looking for ideas on how to spruce it up and make it more engaging for my kiddos! I try to write every day in class too! I give my students choices in what they write as much as possible. We must write to a prompt at least once a month to prepare them for the test. I believe liking what you are writing about leads to better writing. I love your paragraph of the week. I would love to incorrporate this in the classroom soon! Truth: I am terrible at teaching writing. I don't like to write. I don't like to grade writing. However, I am using Paragraph of the Week this year. It really does work well. My kids are doing much better with it. We are also doing a lot of writing in Social Studies with research. Are there any resources that would help with that? Writing every day. I use your paragraph of the week and essay of the month products. I would love to try this with my students. I have not heard of POW. It sounds like a great idea. I also have my student write every single day. We do a quick mini lesson then students spend 35-40 mins writing independently working on their writing. I love your idea of paragraph of the week and would like to add that into my writing program, perhaps after break! Thank you for sharing your wonderful ideas! !